This Symposium is organized by local DAA members and volunteers. We encourage you to become a member of the DAA and join our local efforts. Become a member and reach out to one of the local chapter leaders, Krista, Charles or Feras. Over the past few years, we’ve seen the holiday rush begin earlier and earlier. And we’ve also noticed that the shopping frenzy is extending beyond the traditional season, with transaction rates in 2013 boasting lifts even after Christmas. These trends make for a lot of opportunity for online retailers, but you need to play your cards right. The most important thing you can do to ensure seasonal success is to plan your digital strategy now. 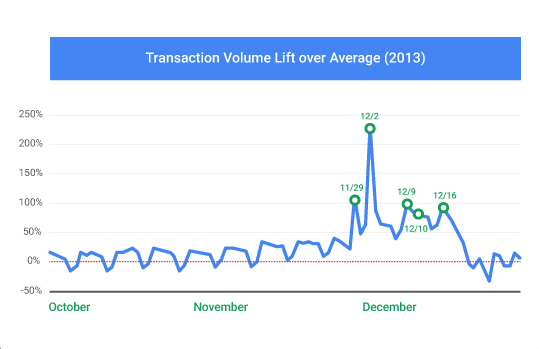 We’ve analyzed transaction behavior from a portion of our Google Analytics accounts over the 2013 holiday season to develop a guide for seasonal success. Which days drive the most transactions? In order to develop a successful holiday retail strategy, it’s important to first understand the days that drive the most sales for your business. Once you understand this, you can craft a strategy that optimizes your media and promotion not only for these days, but for the entire holiday season. As digital retailers are well aware, Cyber Monday is THE digital shopping day of the year. It generates the most transactions of any single day and, in 2013, saw a transaction rate lift of 170% over average. In second place is Black Friday, a day that has increased in digital importance over the last three years. By 2013, the transaction rate on Black Friday was 114% higher than average. Beyond these two stars, the table below shows you the top days in 2013 by transaction volume and the lift in transactions rates on each day. In general, beyond Cyber Monday and Black Friday, the Mondays and Tuesdays before Christmas in December tend to generate the highest volume of transactions. Interestingly, the highest transaction days are not correlated to the days with the most sessions (traffic to your site), so avoid using the top session days as a proxy for the top transaction days. How can I drive sales on the top transaction days? 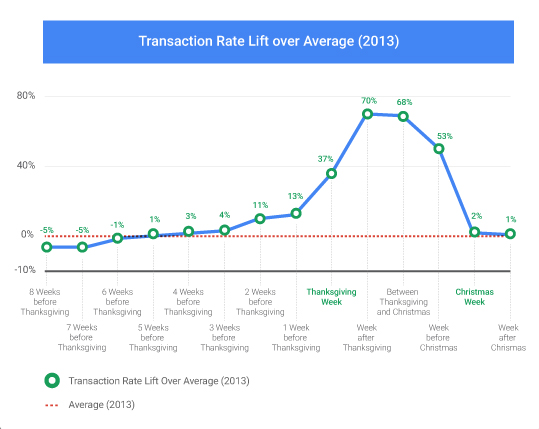 The holiday season generates some of the highest transaction rate spikes and the lowest dips for the entire year. In order to drive digital sales successfully, it’s important that you adjust your bids for auction-based media, such as search ads, appropriately to account for higher transaction rates on key dates and throughout the season. As you navigate the holiday season, use the lift in transaction rates over the average transaction rate as your bid multiplier for auction-based media (learn more about bid adjustments). This adjustment schedule reflects the increased value of clicks that are more likely to convert, and helps ensure that you stay ahead of competitors and get in front of the right consumers. 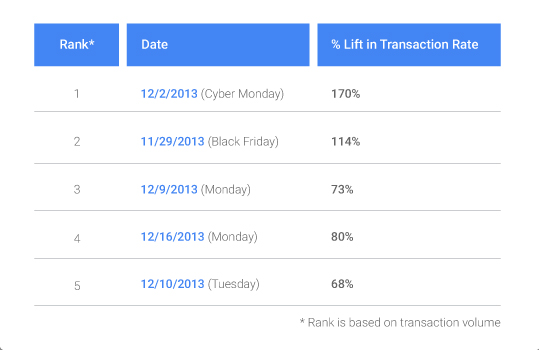 The transaction rate lift for the top days are shown in the table above, while the chart below gives you an idea of the lift for the weeks surrounding the holiday season. As you can see, the top days generate some of the biggest transaction rate lifts, but there’s also plenty of upside in the weeks preceding Thanksgiving as well as right before Christmas. A smart retailer will generate a bid schedule for the entire season, starting 4-5 weeks before the Thanksgiving holiday. Marketing to consumers is notoriously tricky and often trend-driven, making the holiday season a difficult and uncertain time for retailers. However, with proper pre-season preparation, digital retailers can set themselves up for seasonal success in 2014. If you’re a Google Analytics user, you can tailor this analysis and approach to your business, using your own data and the data available in our benchmarking tool. For more strategies for the holiday season, check out our holiday tips blog post and best practices checklist. Posted by Daniel Waisberg and Jocelyn Whittenburg from the Google Analytics team. Let's look at the new features. Sometimes you just want things your own way. We understand! The new full-featured Google Tag Manager API lets you customize the infrastructure to suit your needs, whether that means building your own tools or better integrations with your existing workflow. From creating and managing users to previewing and publishing containers and tags, the API provides all the power of the web interface. For example, the new API makes it easy to manage user access in bulk. It's easy to set permissions for many users at once, or set up your own role-based permissions and let the API give the right level of access to the right people in your organization. Agencies can use the API to easily manage large tagging setups for their clients: create a master container template, specify variations (such as the domain, or the ad campaign ID) in a Google Sheets doc, and use the API to automatically deploy to multiple containers and keep those containers in sync. We have a strong data-driven culture at Novartis and thus in the digital space we’re naturally interested in using data and insights to improve the usability and experience of our websites. With many brands and websites across the globe, collecting web analytics data can become time consuming. 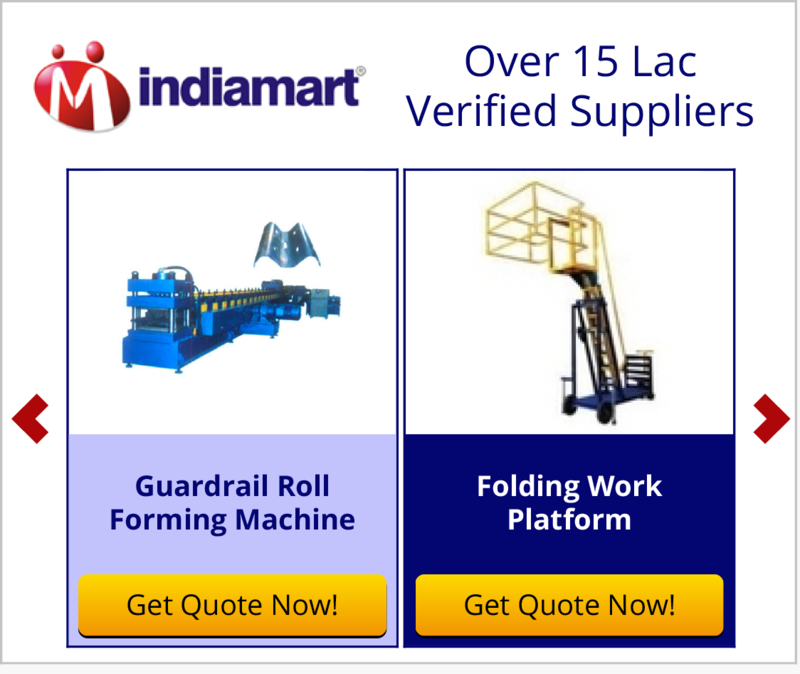 Two challenges we have faced are data consistency and tagging implementation across many sites. We developed a process where we use the Google Tag Manager API to eliminate a manual, error-prone, process and thus were able to shift our attention from several low-value tasks to determining how to create a great digital experience for our customers. Starting in the next few weeks, you'll see more 3rd-party templates in the tag creation flow. We've made it easier for marketers to add tags and minimize errors while doing so. When adding a new tag of your own, you'll select from a list of 3rd-party providers and be underway in just a few clicks. We now offer support for tags from AdRoll, Marin, Comscore, Bizo, Clicktale, Neustar, Distillery, Turn, Mediaplex, VisualDNA, quantcast, Criteo and many more to come soon. Don't see the tag you need? No problem: you can add it immediately as a custom HTML tag. You can also ask to have a new tag template included in future releases, as Tag Manager will continue to add new tag templates. You'll find the full list of tag templates in our help center. Creating a new tag (click image for full-size). The goal: enable marketing managers to easily add and update tags. The new container overview page (click image for full-size). 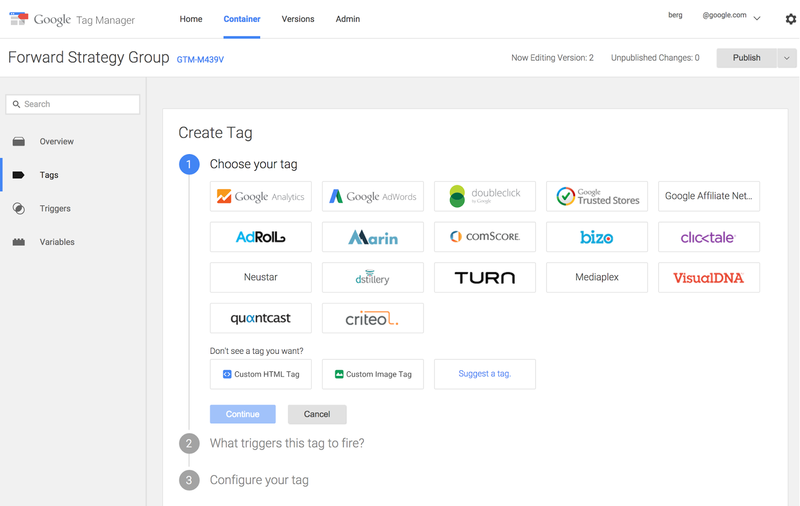 We are confident you'll find the new Google Tag Manager easier to use and a more powerful solution for your web and app tagging needs. 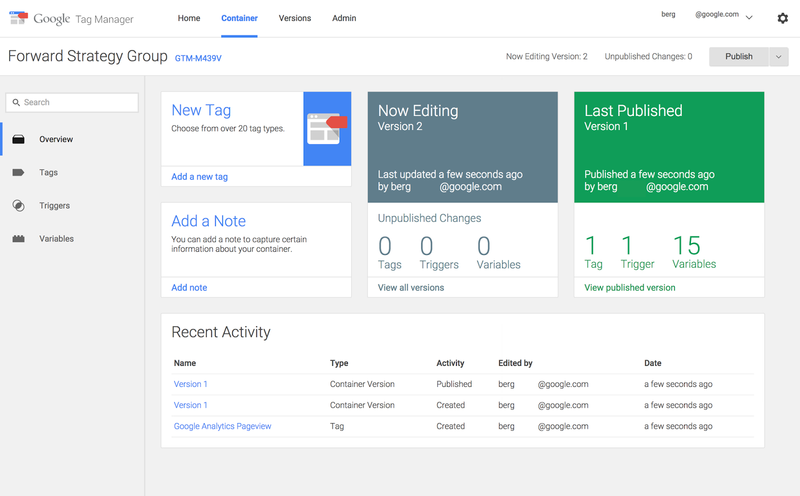 If you are already using Google Tag Manager, you can try out the new user interface today by logging in your accounts and following the instructions. New to Google Tag Manager? Get started today! Over the next few weeks we are rolling out dynamic remarketing to all verticals including hotels, flights, real estate, classifieds, jobs, auto, finance and education. Since we launched dynamic remarketing for retailers, many advertisers like Bebe Stores, Netshoes, and Build Direct have been driving better results and more profits from their remarketing campaigns. When advertisers add mobile targeting to their remarketing campaigns, we’ve seen conversion volume increase by 15% on average at the same price. That's why all our dynamic remarketing templates are mobile-optimized to deliver ads seamlessly across screens. Learn more. Dynamic remarketing with automated bidding can boost performance by calculating optimal bids for each impression in real-time. This means if you sell an $800 camera and a $20 flashlight, AdWords will automatically prioritize winning more of the $800 conversions than the $20 conversions. This helps to maximize the total value of your conversions, not just the number of conversions. Learn more. 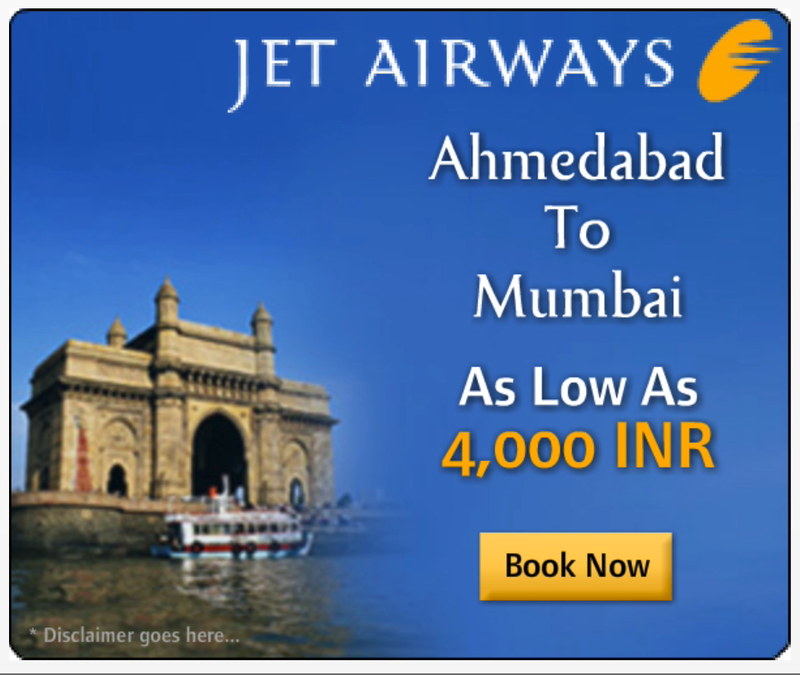 In flights, Jet Airways customized ads based on where and when people were looking to fly, so someone browsing flights from New York to London could see a special offer on business class tickets on the exact day they’re looking to fly. They doubled conversions at a 65% lower CPA by adding dynamic ads to their remarketing strategy. Learn how you can get started with Dynamic Remarketing. Join us for a live Hangout on Air with Google product managers and experts on Thursday, October 9th at 9:00am PT/ RSVP here. For more information visit the AdWords Help Center. If you’re a Google Analytics user, you can visit the Google Analytics Help Center to learn how to use your existing tags to get started with dynamic remarketing. This post originally appeared on the Inside AdWords Blog.